Known for being overstated and decadent in a number of ways, Dubai outdid itself in January 2010, when it officially opened the Burj Dubai, a 2,717-ft. (828 m) tower that is the tallest man-made structure in the world. But the glory of the title was mired in a tough reality: just a few weeks prior, Dubai's biggest state-owned development company said it was unable to pay its debts. 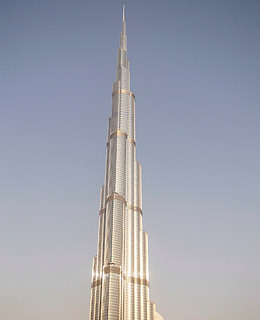 So it came as little surprise that the Burj Dubai was soon renamed the Burj Khalifa, after Sheik Khalifa bin Zayed al-Nahyan, President of the United Arab Emirates, who presented Dubai with $10 billion to help pay off its debts. Despite the obvious irony of the Burj Khalifa representing wealth where there was a decided lack, people still flocked to visit the tower. But even though Dubai is still dealing with its economic issues, the emirate can boast having the tallest occupied floor in the world, the world's highest restaurant, the world's highest fireworks display and an elevator with the longest travel distance in the world. See the top 10 green buildings of 2011.